Today I have some impressive nails to show you. They required such a steady hand that I didn't even bother to do these on my right hand! Hahah. 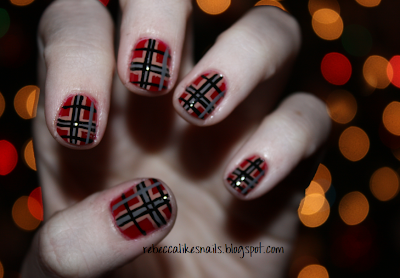 Someday, I am to have a plaid mani as awesome as this on all fingers. This design was inspired by WAH nails, I basically copied some plaid nails I had seen there because they were just so beautiful. Doesn't my Christmas tree make a nice background? I used a really long striper brush to create the very skinny and straight lines. Perhaps as a reward to myself after finishing the last of my midterm hell on the 19th I'll recreate these with new colors and try to do it on both hands! So cute! Great job, and I bet with enough patience you could do it with your non-dominant hand too! so cute! And hey...email me please at kronicles.konader at yahoo.com and I'll see what i can do about shipping for you. I love it :) It's really classy!